When Muriel Raggi’s relationship with her boyfriend became violent, she didn’t flee immediately. She refused to leave without her dogs. Her Rottweiler and her daughter, then both 8 months old (pictured above with Raggi in a recent photo), had become best friends. They crawled around on the floor together. They played together. They were inseparable. Raggi tried to find a place to go that would take her dogs, but she wasn’t having any luck. She didn’t have the financial resources to get an apartment at the time, and she didn’t have a support system. So she stayed in the relationship, hoping things would improve. Raggi ended up in the hospital and realized that if she was going to get out alive, she had to leave immediately. But what to do with her beloved dogs? Nothing had changed, and she still had the same problem. 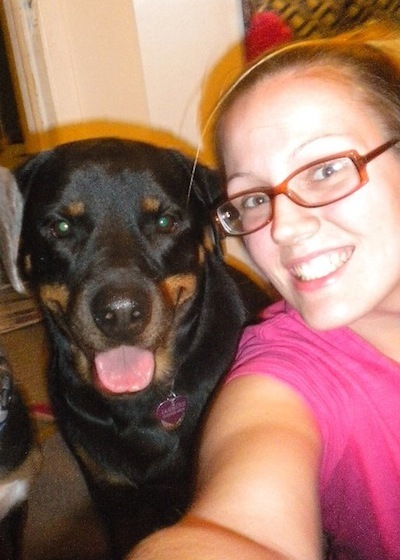 She called local shelters, begging for help, but not a single one could accommodate her pets. And then she found Jennifer Coffey at the Mayor’s Alliance for NYC’s Animals. Coffey assured her that the dogs would be fostered while Raggi and her daughter stayed in a shelter. According to Coffey, program director of Helping Pets and People in Crisis, animal cruelty is a neon-red sign for domestic violence. 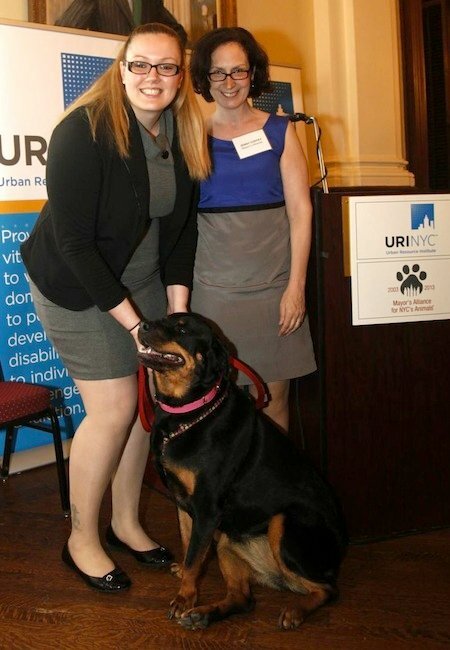 Muriel Raggi and her dog Jasmine with Jenny Coffey, program director of Helping Pets and People in Crisis. It took a while, but Raggi’s story had an effect. After she stayed in one of their shelters, the team at URI decided the system had to change. And so the institute set up a shelter to allow families to stay with their pets. 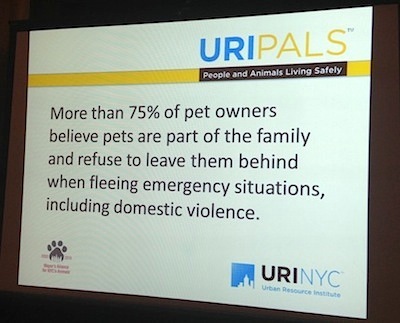 The pilot program, People and Animals Living Safely (URIPALS), began in June, accepting families with cats and small animals. It’s the first program in New York City to allow people and pets to live together in shelter. In New York City, about 600 domestic violence incidents are reported every day to the police department. That’s a shocking number, given that as many as 48 percent of women remain in harm’s way because they won’t abandon their pets. But the people at URI realized they needed some help. Although they considered themselves experts on domestic violence, they didn’t know enough about animal welfare to take the next step. URIPALs contacted Allie Phillips. 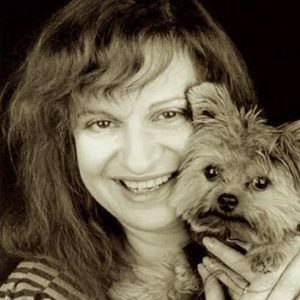 As director of the National Center for Prosecution of Animal Abuse, deputy director of the National Center for Prosecution of Child Abuse, and founder of Sheltering Animals and Families Together, Phillips travels the country, training attorneys and speaking about animal welfare. It all started in the mid-’90s. Phillips was a prosecuting attorney in Michigan, handling a heavy load of domestic violence cases. One particular case really affected her, and it started a chain reaction. At the time, there were no shelters that took pets that Phillips was aware of. So she came up with the concept of sheltering families and their pets together. She sat down and penned a list of practical guidelines. And then time went by. It wasn’t until 2008 that she founded her program. Today more than 75 shelters nationally use her guidelines for accepting pets. When Phillips began reaching out to advocates in New York City, she connected with Jenny Coffey of the Mayor’s Alliance. For 5 years, they kicked around ways to make New York City shelters pet-friendly. Before she goes any further, the entire shelter must be on board. That means the executive director, the board of directors, the administration, client services — everyone involved needs to buy into the project. It wasn’t until January 2013 that Phillips and the crew at the Urban Resource Institute began working together. House the pet directly in the room with the family. “It’s like you’re in a hotel. You have your own room, and the pet is with you,” she says. Ideally, those rooms should have hardwood floors and a radiator rather than central heating. To avoid problems, the pet is restricted to the family’s room. Create an indoor kennel. You take a room and turn it into a kennel. It could be a utility room, a spare office, the garage or a basement. Whichever style a shelter chooses, it will take money to set it up. “Shelters are worried about how much money this will cost,” says Phillips. “I explain to them that people love donating to help animals.” That means shelters are able to tap into money they haven’t had access to before. Partnering with the Mayor’s Alliance gave URI access to many animal welfare agencies that offer support, including a number of veterinarians who agreed to provide comprehensive medical exams. “Our clients are accepted into the program, and within a short amount of time, the animal has been referred to the vet for a full screening,” says White-Reid. Within a day or 2, animals that need it can be spayed, neutered or vaccinated. If there’s a serious injury because of violence in the home, it’s addressed immediately. 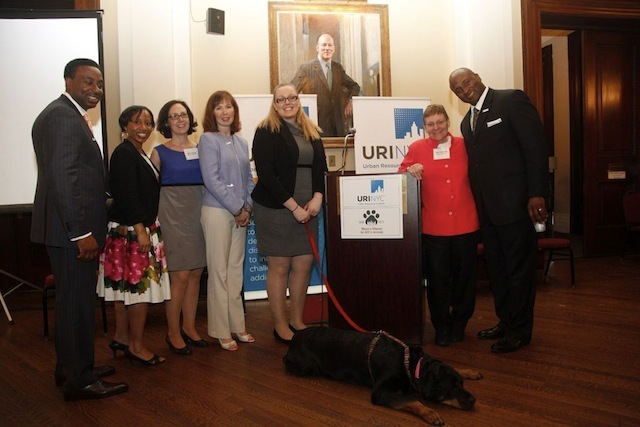 From left to right, Nathaniel Fields, URI president; Jennifer White-Reid of URI; Jenny Coffey of the Mayor’s Alliance; Allie Phillips; Muriel Raggi; Jane Hoffman, president of the Mayor’s Alliance; and Whittaker Mack of URI. Those ready to leave a violent relationship in New York can call the NYC Domestic Violence Hotline (1-800-621-HOPE). The next step is a hotline assessment of the family’s situation, where the closest shelter is located and whether there’s an animal involved. “We then decide if that animal is eligible for the program, and whether the family will comply with the rules and regulations of the program,” says White-Reid. The Mayor’s Alliance also offers transportation services. “In one of the cases that we have currently, the van went out to the client’s home when the abuser wasn’t home, picked up the animals and then brought them to the shelter,” says White-Reid. The URI’s shelter has crates, litter boxes, toys and scratching posts for cats. “We have the room prepared so that when a family comes in, there’s a welcome kit available to them,” says White-Reid. For starters, the shelter is in a confidential location. The shelter develops a safety plan for every client, but they also have a relationship with the local police — just in case. When domestic violence victims leave their community and come into URI’s shelters, safety is the first concern. URI decided to start with cats and smaller animals to see what impact the project will have on the shelter, but it plans to incorporate dogs in the future. “We’re collecting data to see what we learn from this experience, and then we’ll expand services going forward,” says White-Reid. Part of the challenge that Raggi faced was finding a new place to live. It’s almost impossible, especially with a Rottweiler and pit bull, to find pet-friendly housing in New York City. At only 4 months, the pit bull was the younger of the dogs. 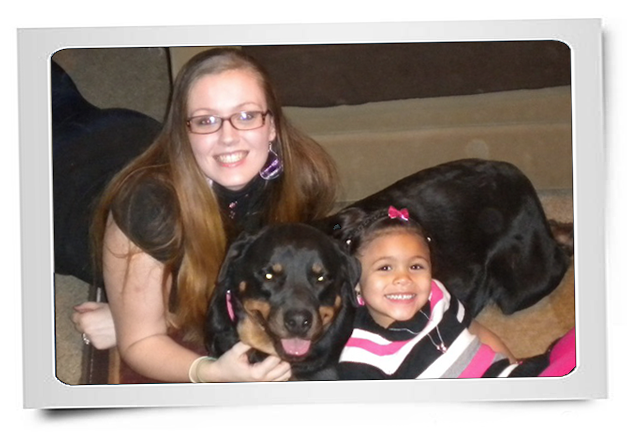 Belle had a much stronger bond with the foster family than Jasmine the Rottweiler. “Jasmine and my daughter were close, and I couldn’t break up that bond,” says Raggi. Her story is not an uncommon one. “A lot of people suffer from domestic violence, but it’s a story that also goes untold because there’s shame attached to it,” says Raggi. The story needs to be told. Donations are being sought to develop a dog run and modify infrastructure, such as flooring and soundproofing, to make the shelter safer and more comfortable — and appropriate — for dogs. No donation is too small. This program is so important, and we want to see it thrive and become a permanent fixture. It’s easy to donate. Just go to this page to donate either online or by mail. Also, if you enjoyed reading this article, please help us get the word out by sharing it with your friends. You can share it directly on Facebook by clicking this link or send a quick tweet with this link.